Long time readers of the site have likely seen me swinging a crazy looking weighted ball. It was almost 15 years ago when I first demonstrated my homemade tornado ball. In the time since, the same tornado ball has been featured briefly in numerous videos (ex. here). Most recently, I filmed a short clip of myself swinging the tornado ball over the weekend. As expected, a plethora of viewers commented by asking where I purchased the ball or how I made it. For starters, you can see the most recent video below. Notice how I work one side and then the other (similar to how one would swing a sledgehammer). While I’m sure there are commercial options available, my homemade version has lasted over 15 years. It also weighs over 25 pounds. Perhaps I’m wrong, but I’m guessing that most store-bought versions would be lighter and much more expensive. Creating the tornado ball was ridiculously simple. I first filled a basketball with sand. I then sealed the small hole with a flat tire repair kit. I then wrapped the medicine ball thoroughly in tape. 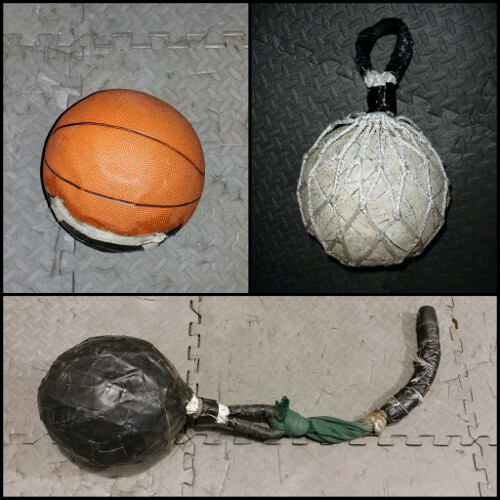 The homemade medicine ball was then enclosed within a basketball net. The basketball net was then wrapped in strong gorilla duct tape. Lastly, the bottom loop of the basketball net was attached to a handle. The green handle seen above is the leg of an old pair of sweat pants (yes, I know it’s crazy). The end has been thickened with pipe insulation to improve the grip. Looking back, I’m not sure where the idea came from to use a pant leg, but it’s been surprisingly effective (although I’d likely use rope if I was creating another). To suggest that my homemade tornado ball is crude is an understatement. I’ll be the first to admit that the design is even low-tech by my standards. When I first made it, I would have never guessed that this ball would last 15+ years. It has been extremely durable however. There’s been a few occasions where I needed to add some extra gorilla tape, but that’s been the extent of the upkeep. Another question that I’m often asked when swinging my tornado ball is how does it differ from a sledgehammer. For starters, I wouldn’t say that one is better or worse than the other. It’s really a case of apples to oranges. I believe the tornado ball and sledgehammer are both useful in their own way. One key difference with the tornado ball is that you can get a bit more reckless with it. If you happen to lose control and bang yourself, it won’t damage you the way a sledgehammer would. The tornado ball is also useful for those who don’t have a tire to strike with a sledge. You can swing the tornado ball almost anywhere (ex. see here). Lastly, the tornado ball can be used for a variety of rotational exercises that couldn’t be replicated with a sledgehammer. I don’t recall what first led me to create the tornado ball but I’m glad that I did. 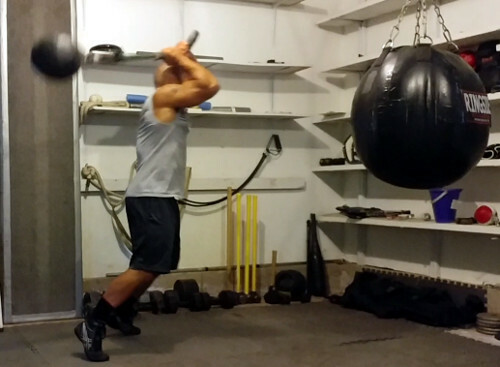 Repeatedly swinging a heavy tornado ball is excellent for power and conditioning. It’s one of those tools that you’ll never outgrow. If you swing it hard enough and long enough, it will eventually catch up to you. Compared to most conventional exercise tools, the tornado ball is also somewhat fun to use. Perhaps there are a few screws loose in my head, but I enjoy mixing in some training that’s a bit reckless. There’s no perfect way to swing a crude looking tornado ball. No matter how you do, it will challenge you and always be ready for more. Reminds me of triggers broom. It’s only had 6 new handles three new balls and and 2 new tornados. Great Video, Great Creativity, keep Rocking, keep it up Ross. Tornado ball. I like it! It looks like you can do a lot of different exercises in different planes of movement without worrying about damaging anything with a sledge hammer.